It has been suggested that phenotypic plasticity can facilitate evolutionary diversification of organisms. If life-history and morphological diversification across a lineage is mirrored in diversification in the same traits due to phenotypic plasticity within a lineage it fulfils one of the expectations that are needed to support this diversification hypothesis. We carried out a laboratory study to examine development rate and morphology between and within populations of the parsley frog, Pelodytes punctatus. 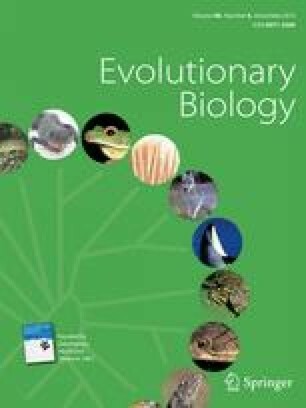 We found that frogs reared in the laboratory had a longer development time, relatively longer hind legs and relatively narrower heads under constant water level compared to those under decreasing water level simulating pool drying. This adaptive phenotypic plasticity response to pool drying was mirrored across populations because frogs from permanent waters had longer development times, relatively longer hind legs and relatively narrower heads compared to frogs from temporary waters. Hence the developmental and morphological plasticity observed within populations was also observed between populations as constitutive expressed traits. We suggest that the morphology pattern observed was driven by a common developmental process (time to metamorphosis), indicating that plasticity may contribute to evolutionary change, ultimately resulting in genetic accommodation of the morphological traits. The online version of this article (doi: 10.1007/s11692-013-9225-8) contains supplementary material, which is available to authorized users. We thank Anssi Laurila and German Orizaola for helpful comments on earlier drafts of the article. The research was funded by the Swedish Research Council to FJ. ARB was supported by a Spanish Ministry of Education and Culture postdoctoral grant (MEC2007-0944) and by a Beatriu de Pinós postdoctoral fellowship (2008 BP A 00032). Oksanen, J., Kindt, R., Legendre, P., O’Hara, B., Simpson, G. L., Solymos, P., et al. (2009). Community Ecology Package, version 1.15-3. http://vegan.r-forge.r-project.org/.